The Critical Care Scholars program is an innovative 60-month curriculum allowing residents to complete internship, anesthesiology residency and critical care fellowship in an integrated fashion. We believe that this comprehensive program will enable graduates to better meet the needs of critically-ill patients. 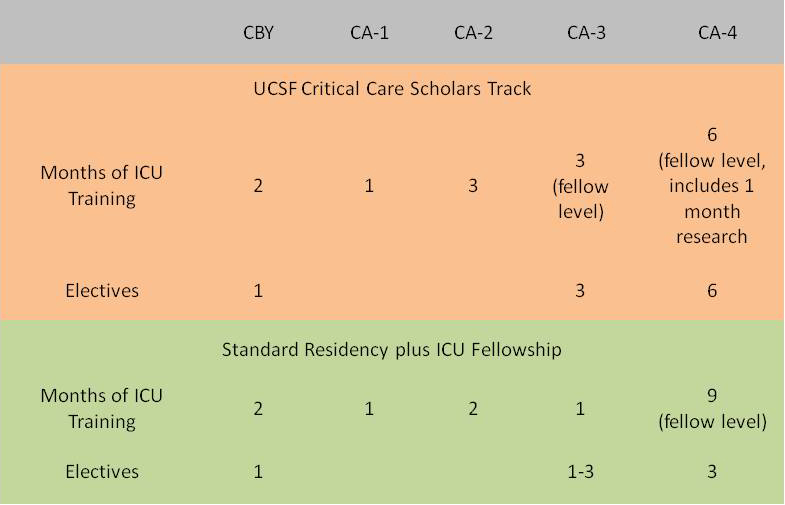 As demonstrated in the diagram below, after finishing the internship (Clinical Base Year), CA-1 and CA-2 years, critical care fellowship experiences will be split between the CA-3 and CA-4 years. During these months in the critical care units at UCSF and affiliated hospitals, residents will serve as critical care fellows. Upon completion of this program, graduates will be board eligible for both anesthesiology and critical care medicine.